The butter-yellow wings of the male brimstone are a true herald of spring, and are credited by some as the inspiration behind the word “butterfly”. These pretty yellow butterflies are quite common, especially around open woodland, and are often the first butterflies to be seen in spring. Brimstones emerge from their winter hibernation as soon as weather conditions start to improve, and have been recorded on the wing as early as January when conditions are suitable. Male brimstones have bright yellow fore-wings, while the hind wings are a slightly lighter yellow with a greenish hue. Each wing has a small orange spot on it. The underside of the wings are a pale yellow-green colour with particularly prominent veins. Females lack the males’ brightness, and are a much less striking greenish-white colour. The shape of the folded wings combines with their veined appearance and subtle colouration to resemble a yellowing leaf, giving the butterfly excellent camouflage when at rest. This is a relatively small butterfly, with an adult wingspan of around 5cm (2 inches). It is widespread, and locally common around the country, with populations concentrated mainly in the limestone areas of the Midlands and West of Ireland. Brimstone’s live for about 9 months in their adult form, but spend much of that time hibernating or sleeping. Although they are known to emerge on warmer days in late winter, brimstones generally return to a state of hibernation after these brief sojourns until later in the spring. At this time male and female brimstones pair up and engage in a lengthy courtship prior to mating. Once mating has taken place the females lay small, green, bottle shaped eggs singly onto the leaves or near the unopened leaf buds of their food plants, buckthorn (Rhamnus catharticus) and alder buckthorn (Frangula alnus). Laying generally occurs between April and the start of July, peaking in May and early June. Eggs can be laid up to 4m (13 ft) or more above the ground. Soon after laying the adult butterflies die. Brimstone eggs are about 1.3mm (0.05 inch) long and are almost white at first, turning deep yellow after a few days and finally becoming grey just before hatching some 10 days later. The tiny caterpillars feast on the fleshy leaves of the food plant. When small they rest along the midrib of the leaf and chew down through the layers causing small holes to appear. When larger they move towards the leaf margins and consume the entire leaf. This larval stage of the brimstone’s life-cycle lasts around thirty days. Once fully fed the caterpillar moves away from the food plant and finds a suitable place to pupate, usually attaching itself to a leaf or stem in low undergrowth. The pupal stage lasts about two weeks, after which the adult butterfly emerges. These new season brimstones appear in July, but don’t mate until the following spring. They spend the rest of the summer feeding on nectar to build up reserves for a long winter of hibernation. 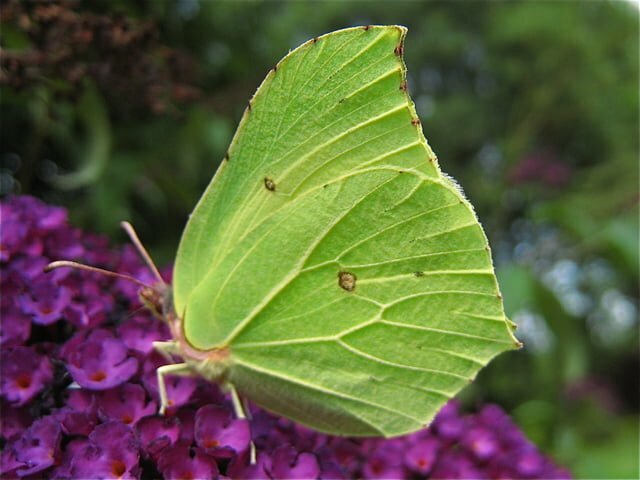 Brimstones show a distinct preference for mauve or purple flowers at this time, including thistle, purple loosestrife, buddleia and teasle. The species is equipped with a very long proboscis or tongue that allows it to exploit flowers with very deep nectarines, such as teasel. In September these new adults search for a suitably sheltered spot to hibernate through the winter. The following spring they emerge, and the whole cycle starts all over again.